RDA Perth has initiated, and is involved in, multiple projects with a variety of stakeholders across the Perth region. These projects have been well planned to include as many stakeholders as possible, and to benefit as many people across the Perth region as we can. 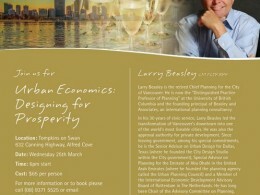 Urban Economics: Designing for Prosperity On 25 March 2015, Larry Beasley provided a fantastic presentation on the importance of integrating economic development within urban planning. While the actual presentation cannot be provided due to its size (it had over 300 images), we are happy to provide the text version of his talk for your reference.